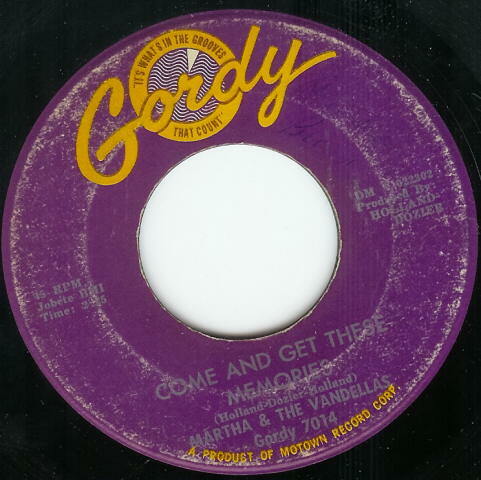 “Come and Get These Memories” would be less memorable were it not the Motown debut of both singer Martha Reeves and the songwriting team of Brain Holland, Lamont Dozier and Eddie Holland. Though Holland-Dozier-Holland would dominate both the charts and the Motown landscape during the mid-‘60s, they got off to an inauspicious start here. Reeves is confident in her delivery, but the songwriting and arrangement is tepid. Before the first minute is over we’ve heard the chorus three times and two verses. The piece sounds more like a jingle than a song at this point. The horns bop back and forth without swinging and the backing vocals of “come and get ‘em” are too peppy to convey any sense of heartbreak. The song fares better in its second half. The horn break at the halfway mark is like flipping a light switch. The brass arrangement grows more aggressive and supportive and Martha, the Vandellas and the Motown musicians really swing through the bridge (“because of these memories/I never think of anybody but you”) that fades into the outro. It’s as if the cast has finally been given direction.